It's that time of the week again when I get to link up with Amanda and Christina to share my favorites from this past week!! I, for one could not be more excited that it's Friday - even having an extra day off, it's just been one of those weeks!! I have a cool announcement on Monday that I'm excited to share with you all, but before that let's get right to some favorites!! I sometimes listen to Pandora when I'm plowing through work and this song came on the Ellie Goulding station and I immediately starting doing a little bounce...that's when you know it's good! How absolutely delicious do these slow cooker buffalo chicken meatballs look?! Can't wait to try them!! 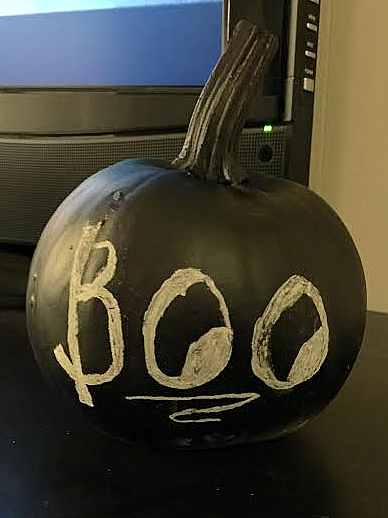 Last week I posted about no carve ideas for your pumpkins and this past Monday I went ahead and spray painted with chalk paint one of the little ones! Right now it say's "BOO" but after seeing Paige's Ninja Turtle Pumpkin I need to step my game up! I stumbled upon this Victoria Secret Full Body workout earlier this week and I have to say I'm a little intimidated to try it!! The instructions say to do each circuit 2-3x (doing the first 4 circuits one day, the next three another day and do the whole thing twice one day). Has anyone tried this?! I took the plunge and decided to go ahead and get business cards made for this little space!! When attending blogger events I never have anything to share with people so I thought it was a good treat since I'm coming up on one year next month!! +Do you take your vitamins? Here are the 10 we should be taking. 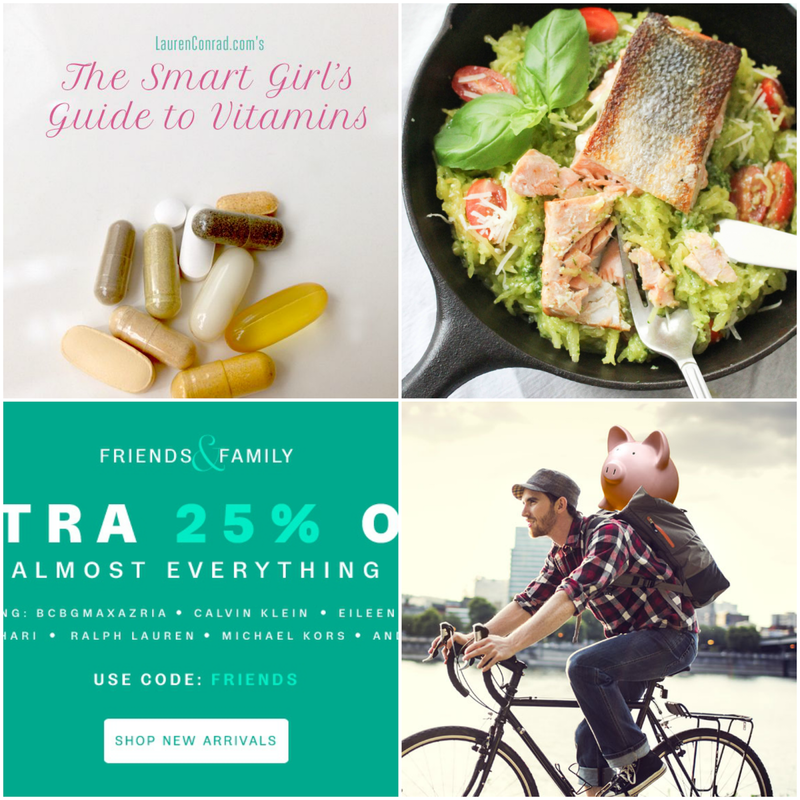 +Pan-Seared Salmon from The Every Girl + Yes ShopBop had their F&F sale - but now it's Lord & Taylor's turn + Saving for retirement - what are you not doing? Oh I love that chalkboard paint pumpkin - I definitely need to decorate mine this weekend! Where did you get your business cards printed? We have some but are looking to get a new batch printed up with a design that's more suited to our blog theme. Happy Friday! So many goodies in one post! Seriously, the way to my heart is buffalo chicken anything, so I will definitely be checking that recipe out. Your business cards turned out great, you should do a post on that process because we need to revamp ours too! Your pumpkin is so cute!! I love those gold balloons featured in the first pic! I can't wait to see your business card and I will be checking out the vitamin guide ,because I am always fine tuning my vitamins! XO Have a great weekend Biana!! Your chalkboard pumpkin is adorable! Love it! And that buffalo chicken meatball recipe sounds super fun! I bet my husband could be down with that, he loves wings! It's funny you posted that vitamin link because I was reassessing just yesterday which ones I am taking and which ones I need to add! Have a great weekend! LOVE the Friday balloons, so festive and fun!!!! Excited to see your business cards, I know they will be beautiful! and now i'm dancing to it! ;) i have been craving fish a lot lately--so glad to see that recipe! happy weekend! SHUT UP!!!! I didn't ever think about usinig chalkboard paint on a pumpkin!! I've got to get to Hobby Lobby right now. Those meatballs sound so good. Love how your pumpkin came out. I just got business cards too, attending events make for an excuse to finally get them. That workout makes more sense doing each section once a day with 2-3 circuits, but all of them in one day - twice! Um no thanks! What a cute pumpkin! Ryan and I hopefully are going to make it to the pumpkin farm next weekend when the weather is supposed to be a bit better. Hooray for business cards! I would love to know how yours turned out and what company/designer you went through. Hope you have a great weekend! Woohoo on your business cards, so fun!! Also thanks for the vitamin list. I'm trying to be better of taking my vitamins. I really want to make those meatballs! I have been looking for a recipe like those slow cooker meatballs! They need to make it on next week's menu! I also kind of want to try that workout slash fear it! Let me know if you do it!! Buffalo chicken meatballs sound yummy. Love the chalkboard pumpkin too. Can't wait to see how your cute business cards turn out! Have a great weekend lady! Thst pumpkin is so cute!! What a great idea! Omg those meatballs! They sound so amazing! Let me know how your business cards turn out! I got some made and wasn't impressed but I guess they'll do! My one year is next month too! :) Halpy Friday! I've made tbose meatballs before, they are fabulous and the husband really loved them! Have a great weekend! Love that VS workout too, used to do it all the time at home! 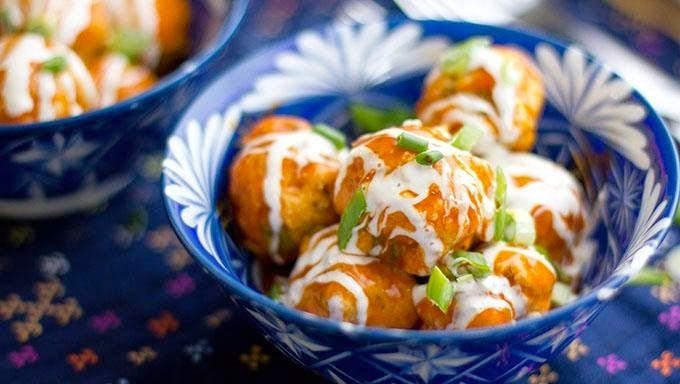 Buffalo chicken meatballs sound amazing! Congrats on the business cards...that's so exciting! 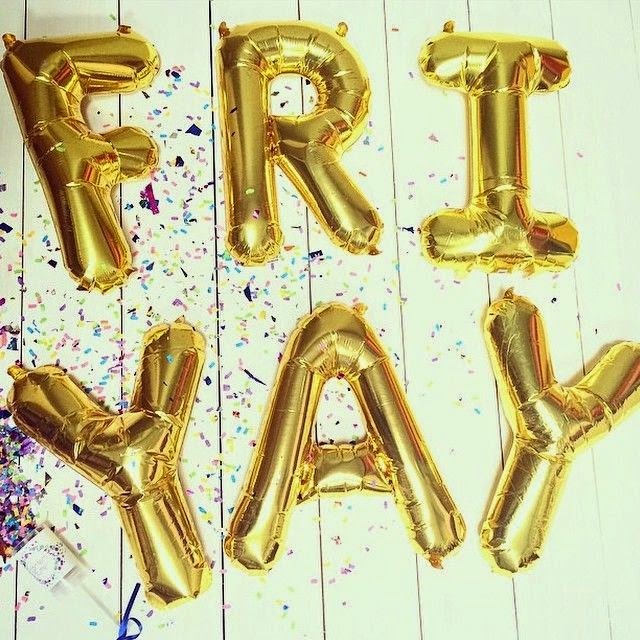 Happy Fri-Yay girlie!! Great new cards!! Those buffalo chicken meatballs look yummie. Have a great weekend. The weather is suppose to be nice. October has been such a good month weather wise. Chalkboard paint on a pumpkin is such a clever idea, and it looks so cute too! Have a great weekend! That vitamin post was so helpful. I started taking probiotics which I love but I'm also on the lookout for other great ones to take! And those meatballs look amazzzze :) Have a wonderful weekend! I have those same meatballs pinned and can't wait to try them! Maybe this weekend?! Also love the chalkboard pumpkins... sooo much easier than carving. It always starts out fun and then turns into a PITA, haha. Happy Friday! Oo, those meatballs are making me hungry! (Well, more hungry than I already am!) Love you chalkboard pumpkin, too cute! That workout intimidates me too! :O Have a great weekend! That workout definitely looks intimidating but I may need to dry it!! Congrats on getting business cards- definitely post a photo when they come in! Happy Friday! Great round up! Love that pumpkin and recipe! OMG! I love your business cards so much! Great choice! That VS workout probably is great but that seems like so many exercises. I feel lazy just reading it all. Haha! drooling over those meatballs, and now off to read about which vitamins I shouuld be taking! I definitely need to make a business card purchase! I'm going on two years and haven't made any! Definitely on my to-do list for this weekend. And pinning that workout for sure! Hope you have the best weekend! xo! Love the business cards, I took the plunge last year and I love having them on me! and those meatballs look delish! Uh oh...now I'm likely to spend more money at the Lord & Taylor sale...but I'm actually just SAVING money, right??? 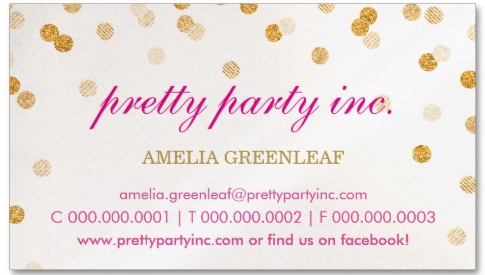 I'm loving your fun, sparkly business cards! I've always wondered how the chalkboard paint would turn out...your pumpkin looks like it was a success! Have a fabulous weekend! Just printed out the meatball recipie! I love anything that says "buffalo"! I also like that work out but it looks like a killer! Gonna try some out today! Who doesn't want to look like a Victoria Secret model?!?! I didn't know Victora's Secret was posting workouts and holy crap, that is a serious workout. Gotta do something, right? Those meatballs look amazing. I have spaghetti and meatballs on the list for dinner at some point this weekend and now I feel like I wanna do meatball varieties. Thanks so much for the shout-out! My husband does have some mad pumpkin decorating skills! And that song is a total jam! Pinning those meatballs now! I agree that the work out looks totally intimidating! Happy Friday, my friend! That pumpkin craft is too adorable!!! Those meatballs look amazing!! Congrats on your new cards :) I take so many vitamins & supplements it's ridiculous, I'm covered on all of them! It's a good thing I'm someone who never forgets and doesn't mind taking a handfull at a time twice a day haha! Blog business cards are so exciting! Did you get the design of the one you posted?! I love it! And isn't it the best when a good (and new) song comes on Pandora! I love your pumpkin! I got two small ones to paint, but I don't know if I'll actually get around to it.. the chalk paint is such a good idea! Definitely going to print off that workout and take it to the gym with me. I really need to get better about going to the gym and having a routine to stick to. Also, that recipe?! Yum! aw love the business cards! how exciting :) I haven't had a reason to need them yet, but they are a good idea! I saw that VS workout, I'm intimidated to try it as well, but I'm definitely going to try it (after the half marathon!). Those meatballs look delish! Um, that workout looks terrifying!! I want to try it but I'm also totally scared that I would die! Happy Friday! Buffalo meatball bites?! What?! Must make! and I am so happy you got business cards - they are so useful at events! yesss love that ellie song! her voice is amazing. those meatballs look divine. happy weekend love!! And business cards are super exciting!!! Can't wait to see them and happy blog anniversary in advance! Thank you for sharing these! Those buffalo chicken meatballs looks delicious and I would love to give that Victoria's Secret workout!! yes to chicken meatballs but then i will have to do that workout to work it off! haha it does seem intense! I am TOTALLY doing that VS workout!! awesome! wow, business cards for your blog!! congrats, that is so exciting!!! !